PCC technology entered the age of satellite television thanks to a recent remote live broadcast at National Capital Trolley Museum. In the pre-dawn hours of Friday, February 17, 2006, the Museum hosted a live remote broadcast by Holly Morris, a feature reporter on the Morning Show at Fox5 News in Washington, DC. This was the second visit from Fox5, the first being a remote broadcast about 10 years ago by weatherman Tony Perkins, then at Fox5, and most recently at ABC&apos;s Good Morning America. Fox5's satellite truck at NCTM. Wells Drumwright photo. Holly Morris hosted two major on-air segments. The first featured a group of children engaged in the Museum&apos;s scavenger hunt activity. This segment was meant as a promotion for the Museum&apos;s annual Cabin fever Day, held on the last Saturday each February. The second segment featured an interview with Wells Drumwright, a Museum volunteer who also happens to be a retired dentist. Holly interviewed Wells about the history of DC Transit 1101. 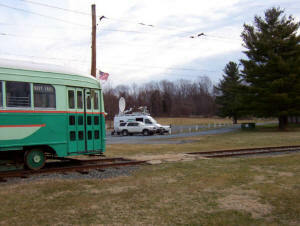 After the broadcast, Wells snapped a photo of DCTS 1101 with Fox5&apos;s satellite truck in the background. The crew from Fox5 enjoyed the visit to the Museum. The cameraman made use of the platform setting at the front of the visitors center. Once he learned that the cars could be moved around to suit his needs, he seemed to have a lot of fun staging his live shots. In preparation for the broadcast, I exchanged a stream of e-mail with the producer in the studio at Fox5. It helped both of us to work out the setting for the two main broadcast segments in advance, anticipate questions and exchange information. Wells appreciated knowing the general theme for his interview, and we made a point to include a mention of his career as a dentist. The children were also a plus as a focus for demonstrating several of the Museum&apos;s activities and exhibits. The broadcast was a positive experience for all of us involved. The broadcast was a positive experience for all of us involved. Following the publicity on Fox5, the Museum received over 200 visitors for Cabin Fever Day, which was a good crowd for a Saturday in February.